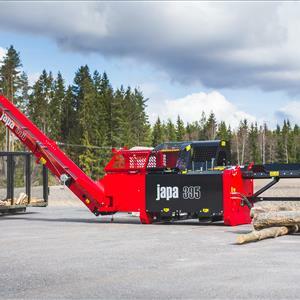 The AMR FB500 series of logs splitters are ideal for splitting pre-sawn rings into firewood, the splitters have a large table to support the timber, 2 handle grips and control mean the timber is split accurately and safely. The splitting stoke is adjustable so increasing the efficiency of the machine. The return speed of these machines is very fast giving a very high output. The large splitting table means the timber can be positioned under the knife to achieve the best splitting position meaning knotty timber can be split with ease. Supplied on Solid Rubber wheels the machine can be moved around the yard and lifted by 2 people into trailers/pickups etc. Power options include Electric 240 or 415 volt, Honda Petrol engine or Tractor PTO.